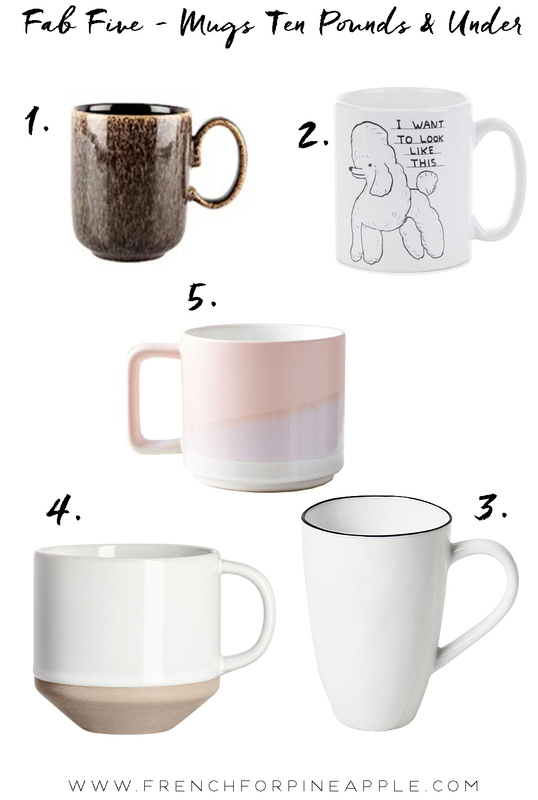 Mugs are a peculiarly personal thing, don't you think? Well perhaps not so peculiar, given that if you're a hot drink drinker, you probably use a mug anywhere from once a day, to constantly, all day, every day. So understandably, they need to work for you. Most people definitely have preferences as to size, shape, colour and feel - right down the the thickness and curve of the handle. And yes, it's probably a sign of age when you start to care about these things. I've gathered five favourites that are catching my eye at the moment. A rather eclectic mix I admit, but actually this is quite a good reflection of my taste in general - forever torn between classic and grown-up, but unable to resist a bit of girly fun. Different mugs, for different moods! I'm keeping the price to ten pounds and under for this round-up, and on Monday there's a second round-up of mugs for over ten pounds, because there are some beauties available at all price points that I feel I need to share. Please note that this post contains affiliate links marked with an *, which means that I receive a small commission if you click on my link/s and make a purchase. Pop back on Monday for my ten pounds and over round-up - expect another mix of grown-up, and er, not so grown up.